Reports were received to me by my scouts that Limerick was undefended and I ordered some of my good troops to move with all haste to assault the town with the Almighty’s blessing. Unfortunately the heathen Lord Hopton had also decided to return to the town with a great many fellows following him in support and were aiming to be there at the same time as my arrival on the field. My forces were ready to save this town from the heathens and bring the persons within this fine town into Gods glorious support of our forces, however Hopton (curse him) had also arrived onto the field and assaulted my brave fellows who were greatly outnumbered against his force of many more troops. 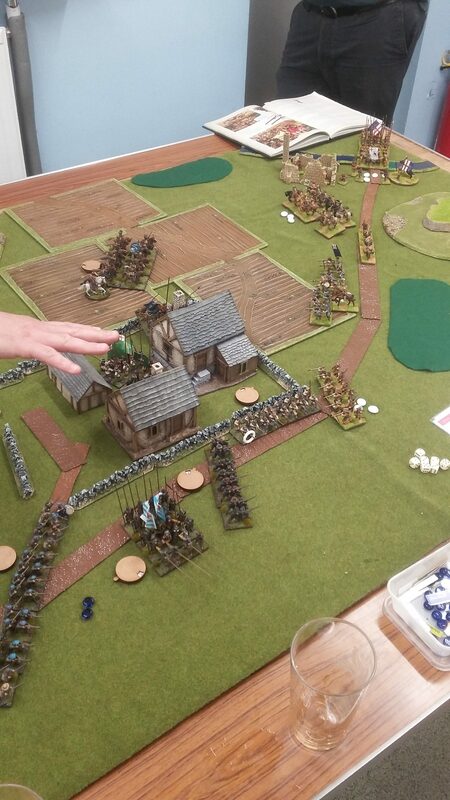 My brave musket fellows gained access to a small village and took up defences to withstand the expected attack from Hopton . 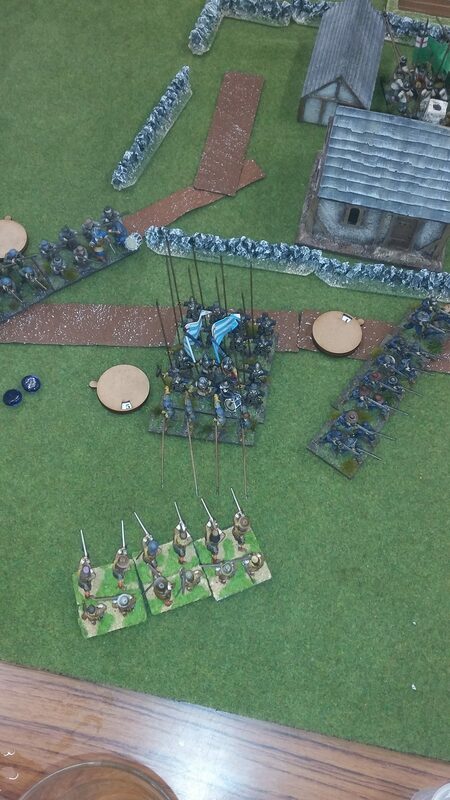 I also made my troops outside the village ready to push back the poorly trained defenders of Limericks outer defences should they sally forth against my forces. Hoptons forces were seen to crest the hills nearby and thus revealed to me the size of the force he had arrived with. It was with the grace of our almighty Lord that my brave fellows were able to stall his heathens as they tried to force my brave musketeers defending the village walls back. Hoptons troops were obviously not keen to take on my fellows as they seemed reluctant to close and thus allowed me time to pray to God for guidance and support. God spoke to me and advised that I should withdraw and save the fight for another day and spare my fellows to live and worship him in all his mighty. I thus decided I had to move my forces back along the road the way I had come towards the river where I had left some fine fellows to defend the ford should I require to travel back this way. My brave Lord Samuel and his force of muskets requested the honour of defending the village and my withdraw against Hoptons troops and it was with heavy heart that I agreed to his wish. 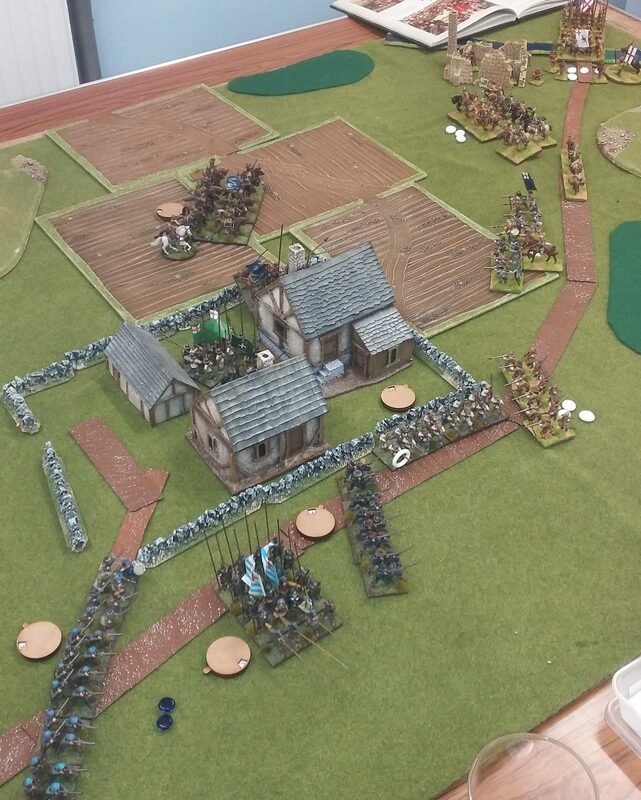 Hoptons muskets sallied around the side of the village to assault my front and brave Lord Samuels muskets. I ordered my musket fellows defending the village walls to retire back to me which they did superbly and requested that the fellows guiding the baggage train to make all haste to the rear. 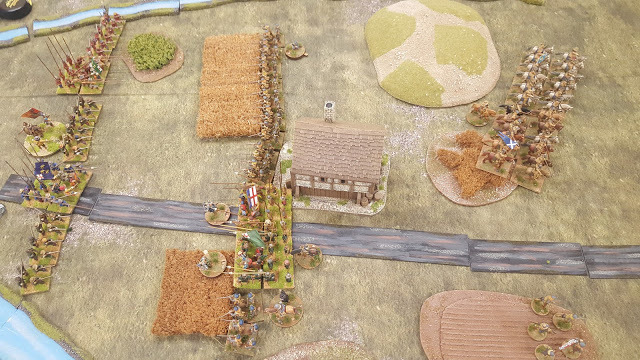 Hoptons troops were able to then capture the village (much to the consternations of the locals who had welcomed us with much revelry) and threaten the flank of my much smaller force. God must have smiled as I was able to order a fine retreat away from the village but I was mostly dismayed to see the heathens over run Lord Samuel and the artillery fellows and capture the cannon. I ask my bishop that he pray for their brave souls. My brave and just Cavalry fellows under the leadership of Lord Daniels attacked Hoptons horse as he tried to flank my force and justly gave them a soundly beating. My wagon train and foote managed to retire under much pressure towards the ford and were able to make good their escape. The horse retired with much cheering and hollering of goodness from my foote after their display of prowess against Hoptons horse. Lord Hopton obviously decided that he could not risk any further loss of heart from his heathen supporters and delayed any assault upon my rear force and thus my fine fellows were able to make good their escape from the field of battle. I state that this 1st Battle of Limerick was a fine showing for the Parliamentary cause and showed to my men that the enemy are of much inferior quality and that I have Gods support in this campaign. Upon hearing that the vile Roundhead forces under Lord Inchquin were moving to assault the defenceless city of Limerick, the noble Lord Hopton marched his forces there to intercept them. Hopton’s Cornish veterans crested the hills to the South of Limerick and attempted to cut off Inchquin’s forces which were strung out along the main road to the city. 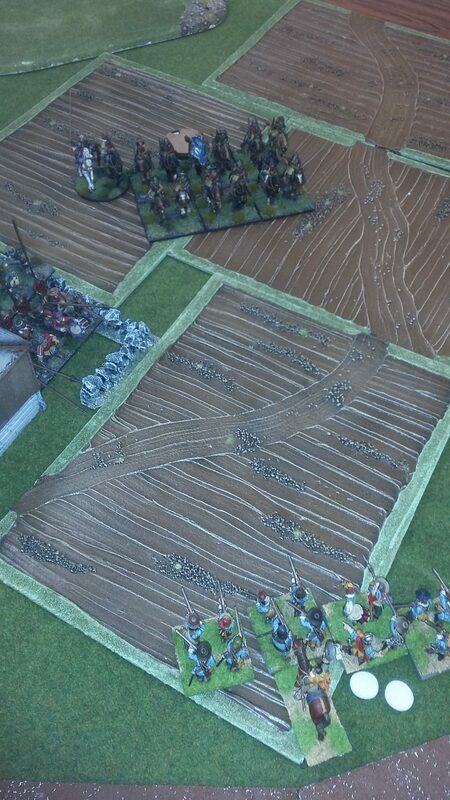 Unfortunately, a combination of difficult terrain and a strong survival instinct amongst the Roundheads (basically poor dice rolling from me and good dice rolling from Gary) enabled the majority of Inchquin’s forces to run away. The Pikemen of Slanning’s Regiment distinguished themselves against the rearguard by rushing forward and slaughtering a unit Roundhead musketeers whilst the musketeers of Lord Mohun’s and Beville Grenville’s Regiments accounted for another unit of musketeers and captured the Roundhead artillery. Although nightfall enabled Inchquin’s remaining forces to slip away, the people of Limerick can sleep well in the knowledge they have been saved from Roundhead atrocities.